The first American printing of Dunsany's fourth collection of stories about the exploits of Joseph Jorkens. Reprint of Dunsany's second novel, first published in 1924. A collection of stories reprinted from various collections. Reprint of Dunsany's first novel, first published in 1922. Reprint of Dunsany's third novel, first published in 1926; the second installment in the Chronicles of Shadow Valley. Reprint of Dunsany's eighth short story collection, first published in 1919. Reprint of Dunsany's fourth short story collection, first published in 1910. A collection of stories, essays, and plays never before published in hardcover. A collection comprised of all of Dunsany's Pegana stories, including those in The Gods of Pegana and Time and the Gods, plus three stories from Tales of Three Hemispheres. A reprint of Dunsany's first short story collection, first published in 1905. A reprint of Dunsany's second short story collection, first published in 1906. A reprint of Dunsany's fifth short story collection, first published in 1912. A reprint of Dunsany's sixth short story collection, first published in 1915. All of Dunsany's Jorken stories, including several previously unpublished stories, in three matching volumes. One of the best and most influential fantasists who ever put pen to paper was the writer known as Lord Dunsany. If you have spent any time on this site, you won't be surprised to learn that my first exposure to Dunsany's work came by way of the Ballantine Adult Fantasy series and editor Lin Carter, since this is where I acquired much of my early education in classic fantasy literature. It was Dunsany's novels that I read first, most notably The King of Elfland's Daughter, perhaps his finest work. Only later did I experience the numerous short stories that served as the foundation for much of his fame. Writers as diverse as H.P. Lovecraft, Ursula K. Le Guin, and Arthur Clarke have noted Dunsany as influences on their own work, and many, including Lovecraft, have praised him above all others. Reading his stories, it is easy to see why he is regarded so highly by so many. This is especially true of his early short story collections, in which he adopts a biblical prose style to describe a wholly invented universe complete with its own mythology and pantheon of gods. The dream-like quality of both his language and his story settings have rarely been matched, although many writers have tried. Read his often praised and emulated story Idle Days on the Yann, perhaps his most famous single work, and see if you don't agree. If you are not yet familiar with the work of Lord Dunsany, I encourage you to seek it out immediately. Fortunately, most of his stories, novels, and plays (yes, he was also a playwright) are in print and available in a variety of editions, including titles from Night Shade Books and Wildside Press, among others - visit The Attic for links to both publishers. 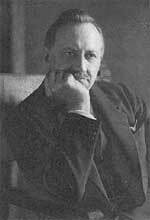 Lord Dunsany was born Edward John Moreton Drax Plunkett, the 18th Baron Dunsany, in 1878 in London, England. The son of John William Plunkett, the 17th Baron Dunsany, he was raised in both southern England and at Castle Dunsany in eastern Ireland. Educated in England, he inherited his title upon the death of his father in 1899, and in 1901 he moved back to Castle Dunsany, where he resided until his death in 1957. In 1904, he married Beatrice Child-Villiers. Their son, Randal, the 19th Lord Dunsany, was born in 1906, one year after the publication of his first book, The Gods of Pegana. This was followed by Time and the Gods (1906), The Sword of Welleran (1908), A Dreamer's Tales (1910), and The Book of Wonder (1912). More fantastic tales followed, but by 1919, when Tales of Three Hemispheres was published, Dunsany had begun to switch literary gears. He began writing novels and plays, and when he returned to the short story form, it was usually to chronicle the adventures of his famous character Joseph Jorkens. He continued to write until his death, leaving behind one of the greatest legacies in all of fantastic literature.